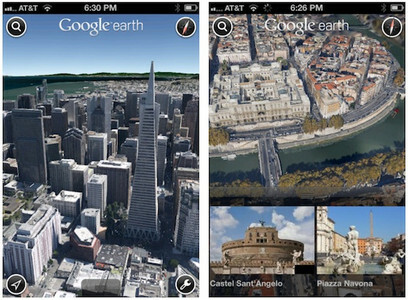 Google has announced the arrival of Google Earth 7 for iOS devices which brings in 3D imagery to iOS devices so that now users can take a flight over cities. Now we do know that with the arrival of iOS 6, Apple will ditch Google Maps for its own Maps which also bring in 3D views for many cities with feature called Flyover. But then Google also went ahead and announced that Google Earth 7 for iOS will arrive with the 3D imagery too and compete directly with Maps from Apple. And now users will be able to see the 14 regions that Android users are already able to view in 3D and those include Los Angeles, Boston, San Francisco, Geneva or Rome with more new additions coming in the next few weeks. But now whenever Google adds more 3D cities to its database, both those platforms will get them at the same time. But the 3D imagery on iOS is available only for iPhone 4S and iPad 2 or later. Download Google Earth 7 from the widget below.